Fitbit Charge HR review: the best fitness tracker yet? A simple but super-light hooded jacket that's ideal for keeping out the chill when the temperature plummets. When, or rather if, the sun makes an appearance, the Squamish can be packed into its own pocket and stowed till later. A classic bomber from the king of UK cool, this features a two-way silver RiRi zip fastening, two internal pockets and contrasting sleeves with a lustrous finish. As you'd expect from Mr Smith, the jacket also features some rather fancy printed lining. Swish. Lightweight doesn't have to mean wafer-thin and freezing cold. Finisterre's wind- and water-resistant, packable puffa can be scrunched into a ball-sized bag, yet its 60g of synthetic PrimaLoft insulation keeps you super-snug, even on the approach to winter. Not only is this jacket painfully cool to look at, with its cropped length and check finish, its full lining will keep you warm enough to fend off rival long-haulers when you're next queuing outside a greasy spoon on the M6. 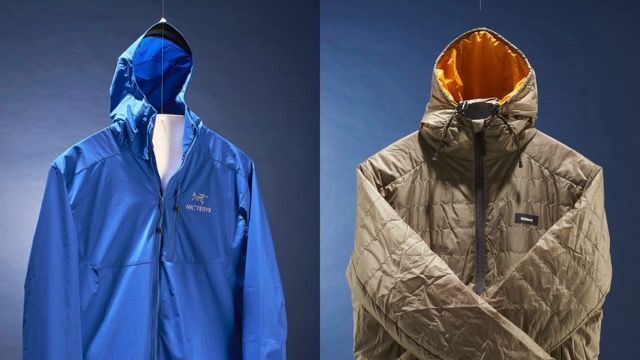 Beat the worst the autumn months can dish out, and look as if you just stepped offyour dad's 60-foot schooner, with Penfield's stylish boating number – it offers rain resistance thanks to a waxy finish, but is light enough to stop you from overheating.